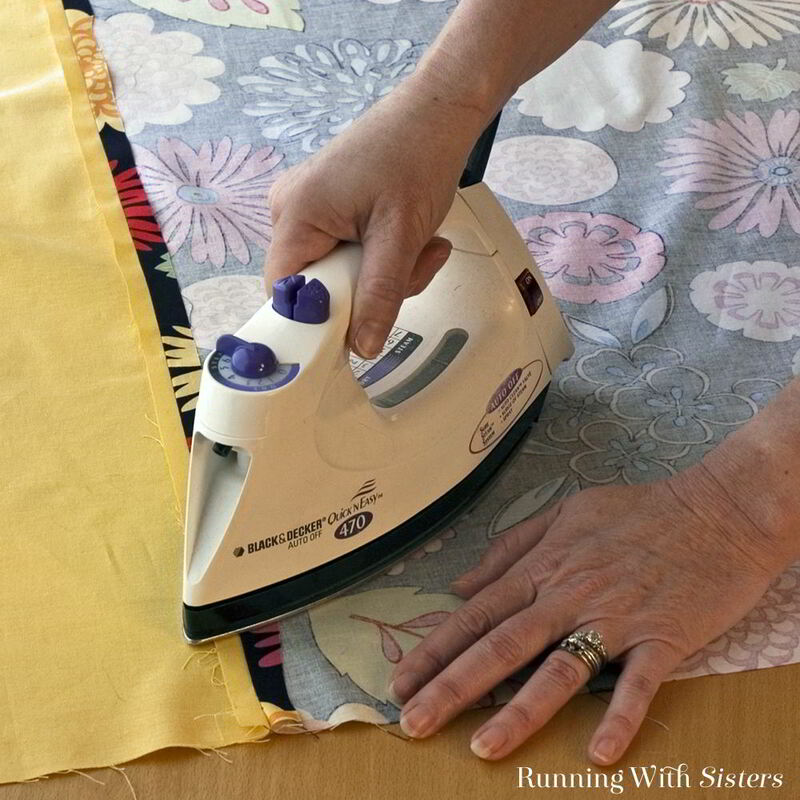 Learn to sew a tablecloth with a built in runner! Want to give your dining room a quick and colorful makeover? Wake up your dining table with a lively, floral tablecloth. A built-in runner design creates a focal area just right for a lovely centerpiece. 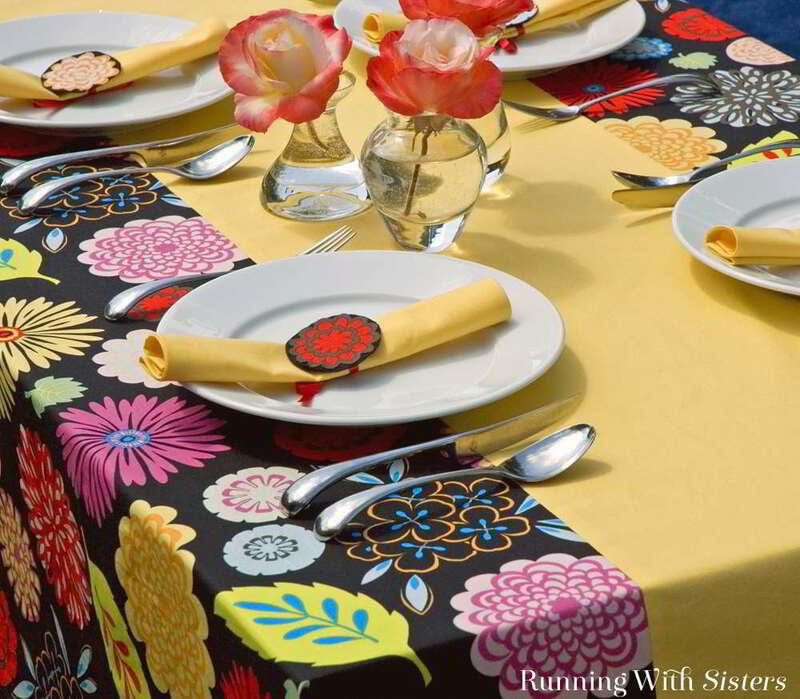 The combination of the elegant runner with the vibrant graphic makes this tablecloth ideal for anytime decorating. Just bring in fresh cut roses to finish it off! Project Pointer: This tablecloth fits a 2½-foot by 4-foot table and has a 12″ drop (how far it hangs over the edge). Since many bolts of fabric are not wide enough to cover a table, we bought one piece of floral fabric 2 ¼ yards long and 44″ wide, then slit it in half lengthwise. We added a “runner” down the center to create the extra width. Step 1. To piece the tablecloth together, lay the buttercup fabric facedown on the black floral fabric (faceup) with the left edges aligned. Pin the left edges together. Open the fabric up and lay the second piece of black floral fabric facedown on top of the yellow fabric (faceup) with the left edges aligned. Pin the left edges together. Step 2. 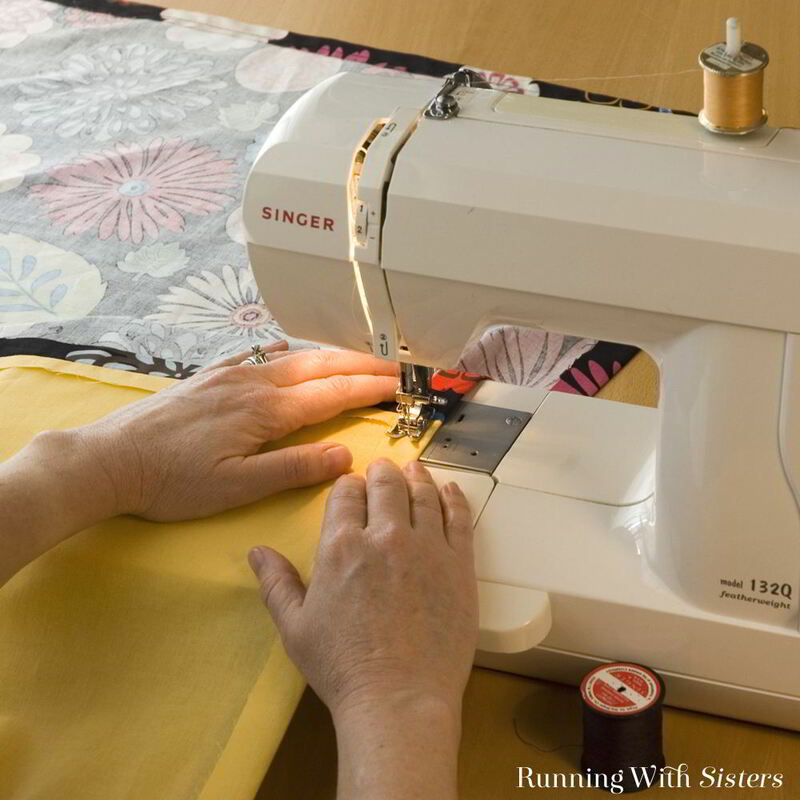 Using a sewing machine and the black thread, sew the two pinned seams ½” from the edge. Step 3. Lay the tablecloth facedown and press the seams open with an iron so they lay flat. 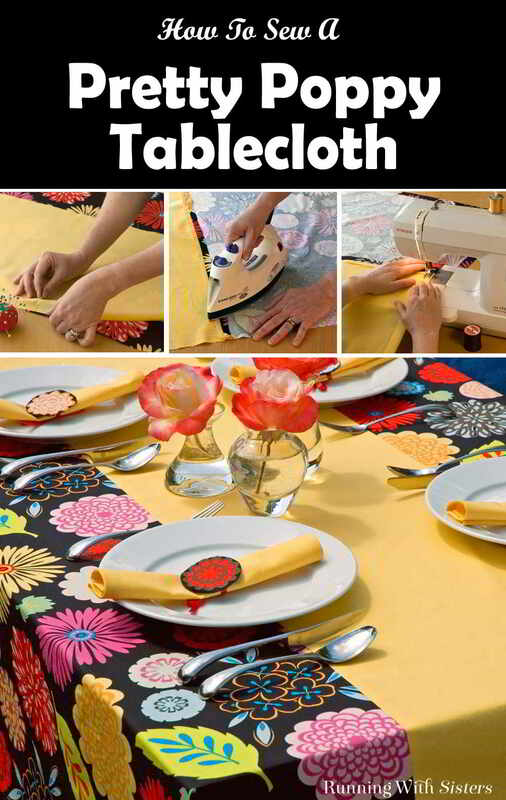 Then iron a ½” hem all the way around the tablecloth. Step 4. 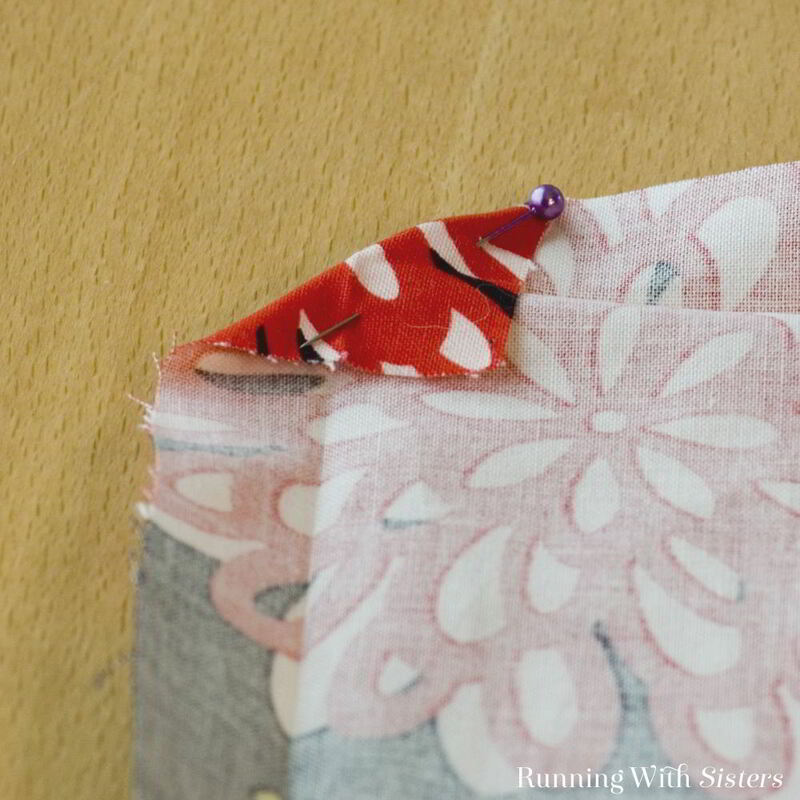 To create a tidy, mitered corner, open the ironed hem at the corner and fold the tip in to the point where the ironed hem lines meet at the corner. Pin into place. Step 5. Fold the two ironed hem edges in until the mitered edges meet in the middle. Pin into place. Step 6. 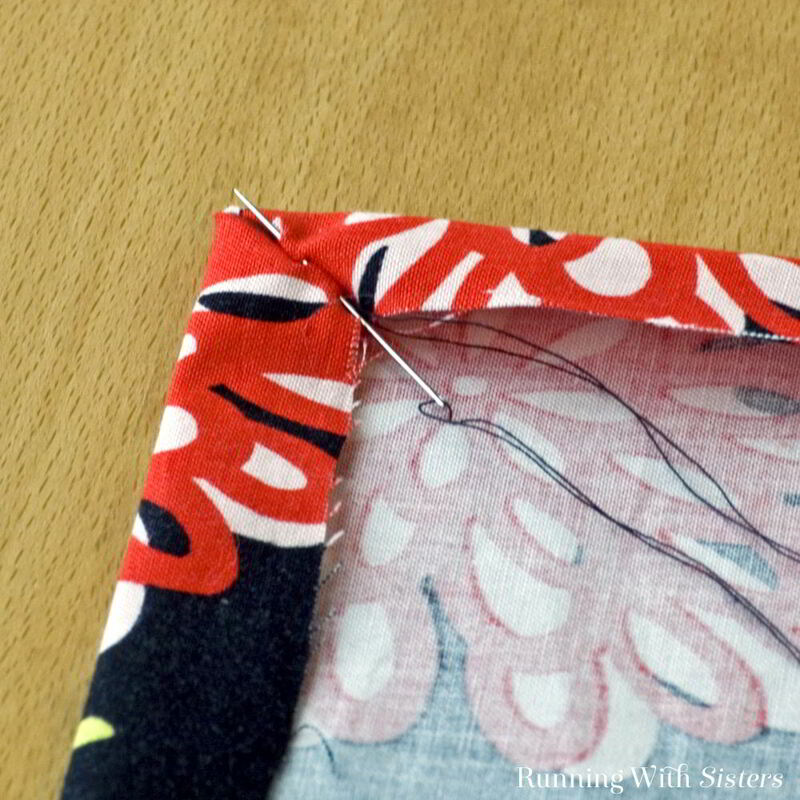 Using a slipstitch and the black thread, hand stitch the mitered corner. Repeat Steps 4 through 6 for the other three corners. Step 7. 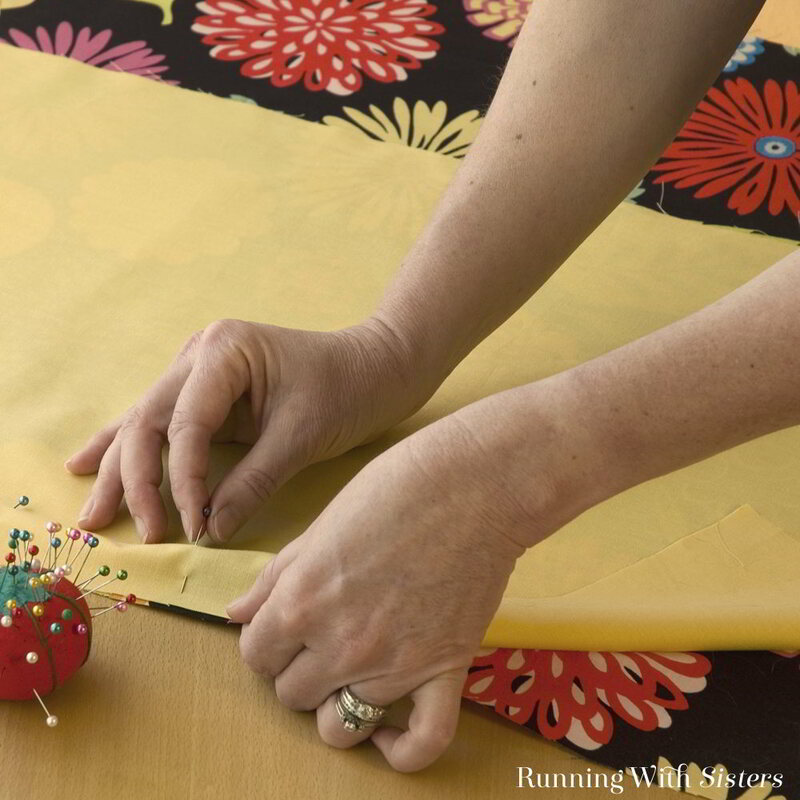 Using a sewing machine, hem the entire tablecloth ½” from the edge. Switch thread colors as you go, so the black thread sews the hem on the black floral fabric and the buttercup thread sews the yellow fabric. 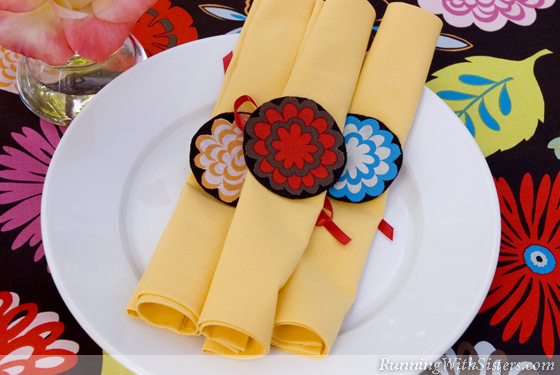 Make fetching napkin rings by cutting out blossoms from your floral fabric and stitching them onto felt cutouts. Attach satin ribbons to tie around the napkins, and you’ve got a garden party ready to bloom! Beautiful! 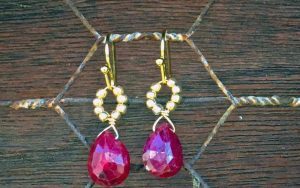 I added this to my DIY Christmas gifts post! what a cute tablecloth! I have just purchased a bunch of floral ones, my head must be ready for spring. 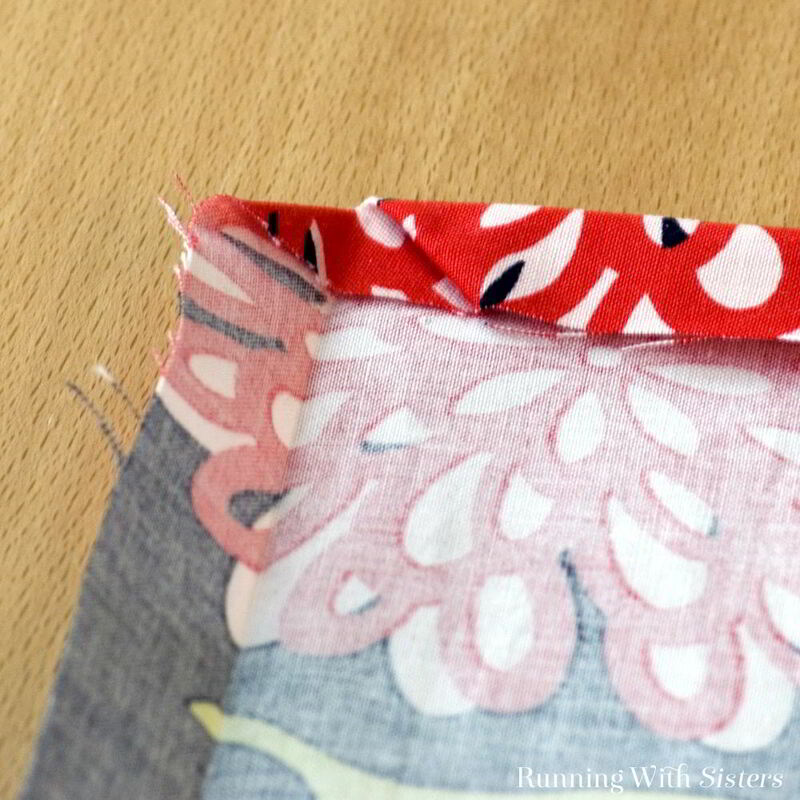 It helps to use a serger to finish the edges of the fabric so you have no raw edges on the seam allowances or edge hem. Thanks for the great tip, Judy! 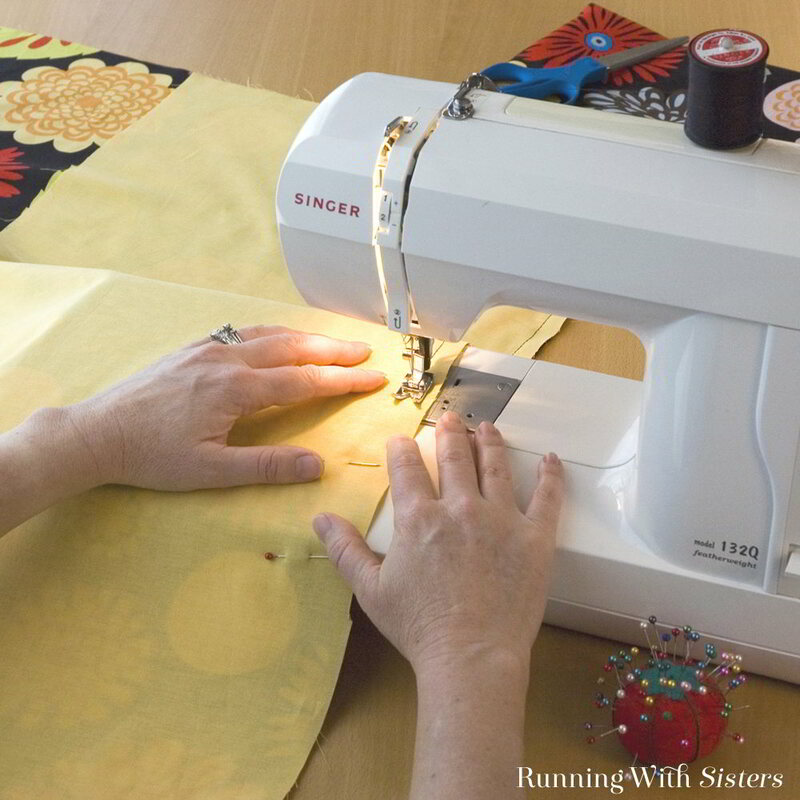 We definitely think this is a great idea for crafters who feel comfortable using a serger. Nice and tidy! 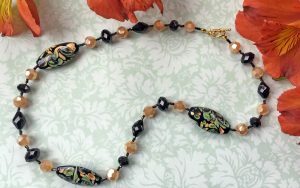 Do you know what manufacturer the pretty black print fabric is from? It is by Alexander Henry and is called Pink Zinnia. We love the colors! Thanks so much. 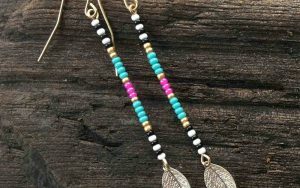 I want to make it for a gift and the recipient loves the colors, too. so I will be looking for an alternate. I love this project! Our table is round (and can seat 6) so I am going to work out a plan to make it a six-sided table cloth. I also think it would look more professional with finished seams – perhaps a type of French seam joining the two fabrics and at double turned 1/4 inch hem. Sounds like a fun plan, Janet. French seams are a nice touch for a more advanced project. Go for it! Janet, that is a great idea for a round table. Did you come up with a plan to do that? I am wanting to make one for a round table, too, but I’m not sure how to make it six sided. I figured out a design that will work with the black print fabric that I have. I will make an octagon out of the black print and border it with 2 different border colors, then applique it to a round yellow table cloth that I will make. I don’t have enough of the black to border the yellow circle. Sounds like a good plan, Roberta. We’d love to see a picture! Beautiful……Loved the way the corners are done.So neat n perfect. 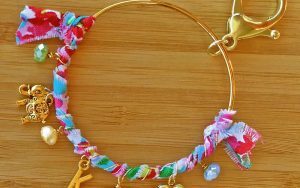 great ideas for a beginner. 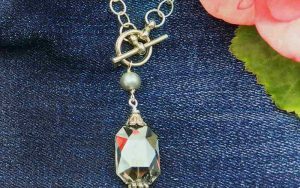 Beautiful and so simple, I will definitely have to make this. Thank You for this beautiful idea.